Julius Malema, now leader of the Economic Freedom Fighter (EFF) of South Africa and Member of Parliament, is a former president of the African National Congress (ANC) Youth League. Jefferson Koijee is currently the Chairman of the Revolutionary Youth League of the Congress for Democratic Change (CDC), Liberia’s ruling party while at the same time serving as Mayor of Monrovia. Both Koijee and Malema hold strategic government positions, and command huge followings through their respective organisations. The meeting of Malema and Koijee in Johannesburg was a 21st century replay of the meeting of President William V.S. Tubman of Liberia and Nelson Mandela of South Africa in 1961. Several parallels can be drawn today, as we look through the ideals and struggles of the 1960s and those of today. In 1961, Mandela, then an exiled freedom fighter met with Tubman to seek support for his struggle for the liberation of South Africa from apartheid rule. Tubman, then a doyen among African leaders, was fully in support of the causes of liberation across Africa. Tubman supported liberation struggles across most of Africa and championed unity and total decolonisation of Africa through the Organisation of African Unity. Malema and Koijee, like Tubman and Mandela have made personal sacrifices to change their countries and champion great causes which are today inspiring young Africans across the continent. In this 21st century, Malema has argued that the cause of political liberation has been attained through the support of the northern part of Africa and it is now time for South Africa to champion the struggle for economic emancipation. This fight started in the ANC Youth League before Malema was expelled leading to the formation of the EFF. Koijee on the other side in West Africa, has championed youth empowerment and a revolution for the total transformation of Liberia through a youth-led democratic movement. He became the leader of the CDC youth league, and in six years organised the grassroots of the CDC to mount a strong opposition to the Unity Party led government then headed by Ellen Johnson-Sirleaf. Common cause, but different ideas? From their political histories, without physically interacting, Malema and Koijee have been committed to the common cause against oppression, corruption, and elitism in their two countries. Long before meeting Malema, Koijee was dubbed by young Liberians as “the Julius Malema of Liberia” for his militancy, commanding influence, his honesty and commitment to the cause of Liberia’s poor, and his fearlessness in speaking truth to power. As the two influential young Africans begin to meet now, it is important to understand their political ideas and their potentials to bring fundamental change to Africa through their local political movements. Lessons from the politics of Malema and Koijee are useful to the greater pan-African movement of the 21st century and the unending struggle against poverty and class materialism in Africa. Since Malema’s ascendancy to the leadership of the ANC Youth League in 2008, numerous academic papers, including dissertations, news commentaries and documentaries have explored his personal and political ideas. The manifesto of his party and the widely sold book, The Coming Revolution: Julius Malema and the Fight for Economic Freedom portrays Malema as a hard left Marxist, and firebrand freedom fighter. He espouses Fanonian philosophy and strongly presents himself a Sankarist, working for the poor and ordinary masses of his country. Malema has lived up to those ideals by fighting within the ANC for land expropriation and redistribution for the benefit of poor and landless South Africans. This advocacy led to him losing the influential post of ANC Youth League President. That however, did not stop Malema even though he had once promised that without the ANC he would return to the village “to raise cattle”. Malema remobilised and established the EFF that won six percent of the seats in South Africa’s 2014 election. Malema’s party recorded such success in less than a year of full political mobilisation. Since entering Parliament, Malema has infused into the parliamentary debate and politics a brand of advocacy never seen before in Africa. He uses the law and sometimes boycotts to fight for his values of racial equality, black empowerment and poverty alleviation in Parliament. 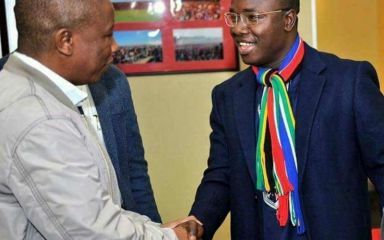 The politics of Jefferson Koijee: Another Malema or a man of his own? Unlike Malema, not much has been studied and written about the political thoughts, values and revolutionary struggles of Koijee in Liberia for many reasons. First, Liberians and observers of Liberian politics have over the years focussed mostly on studying warlords and not paying much attention to activists who pursue non-violent political struggles and achieve unthinkable results with ordinary Liberians. But Koijee’s heroic victory from the 2017 elections – when he successfully mobilised the majority of young Liberians to convincingly elect George Manneh Weah as President of Liberia – has drawn attention to his brand of politics. The interest of some observers now is to understand Koijee’s mass mobilisation strategy, his political thoughts, and his organisational transformation of the CDC Revolutionary Youth League as a movement that eventually achieved the generational change once advocated for in Liberian politics. Koijee has spent most of his life in struggles against successive governments since his days in high school during the reign of former President Charles Taylor (now serving jail terms for war crimes). Koijee mobilised high school students to campaign against conscription into militia forces and to champion rights to education. After the exit of Taylor, Koijee campaigned and lobbied the erstwhile National Transitional Government of Liberia for more youth empowerment programmes and the appointment of competent youth to positions in government. After the election of Ellen Johnson-Sirleaf in 2006, Koijee lived in Liberia as a full time opposition politician and committed himself to the cause of advocating for young people and the prosecution of corrupt officials in government. His imprisonment and threats of lawsuit including from the President’s son could not deter him in his fight against white collar corruption. Koijee resisted numerous temptations including jobs, money and travel opportunities meant to seduce him and lure him to the side of government. He stood firmly during the years of Sirleaf’s rule when many initial opposition figures wavered, capitulated, and joined the preoccupation with illicit capital accumulation in the Sirleaf led-government. From Koijee’s brand of politics, widely focused on youth empowerment, and economic empowerment of poor people, he comes across mostly as a centrist political thinker who is unapologetically sympathetic to left wing values. His entry to government saw a wave of change across the bureaucracy with the appointment of many young people by President Weah. Koijee’s role in driving the government’s Pro-Poor Agenda through innovative initiatives at the Monrovia City Corporation for the transformation and empowerment of slum communities demonstrates his commitment to grassroots politics and economic development, something similar to the political mobilisation and empowerment strategies of Amilcar Cabral of Guinea Bissau and Cape Verde. Like Cabral, Koijee sees peasants (poor people) as the primary beneficiaries of every political struggle. Can Koijee and Malema transform Africa? The politics of Julius Malema of South Africa and Jefferson Koijee of Liberia are inspiring and give one the confidence and hope of a political and economic revival in Africa through grassroots parties led by committed, honest, and passionate young leaders sympathetic to the poor and indigenous communities. Malema’s EFF is now been replicated in other African countries including Namibia, Zimbabwe, Kenya and Liberia. Koijee’s success at unseating a ruling party through a grassroots democratic revolution in a country that saw power transitioned for 70 years mostly through violence and unconstitutional means inspires hope in opposition figures across the continent who have long sought political change, but without success and have contemplated waging armed struggles. Seen together, their success stories represent the collective force and energy of young Africans in their perennial struggle for bread, land, school, medicine and space for participation. Like the Mandela and Tubman of the 1960s, Koijee and Malema are the new leaders of Africa around whom young progressive forces should mobilise and champion the great cause of economic redemption in Africa as a supplement to political liberation.